In Diderot’s lament, we hear the anguish of all those who have resigned themselves to the inability of Enlightenment’s illumination to push its way into the dark miasma of the dreary suburbs. And there is perhaps reasonable grounds for that resignation. However much we might take comfort in the idea of universal equality—whilst taking pleasure in observing our own humble virtue—it is a simple and rather mundane fact that there are some who know much, and some who know very little indeed, and those who know little are not well placed to judge usefully on matters of importance. This is no mark against them; it is not a question of gauging who is the better human being. It is merely a statement of the way the world is, and however much querulous, hysterical tub-thumbing some might undertake in protest, it would be as futile as protesting the despicable tyranny of gravity. 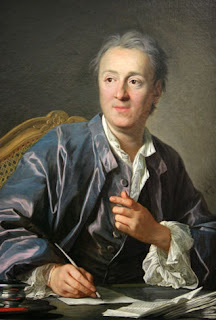 Diderot lamenting the stupid, the miserable, and the busy. But getting bogged down in ructions of that kind is, in any event, entirely pointless, for there is another simple fact which renders Diderot’s observation redundant: the matters of real importance in this world are too far beyond our ken to be susceptible to rational solutions. It is only foolhardiness underwritten by hubris—against which the old-school conservatives such as Burke, Hayek and Oakeshott warned—that convinces us otherwise. Even if we were ourselves, in some meaningful way, rational creatures (which we are so far from being, it’s odd anyone could think it were true), we can quite rationally want a diversity of ends which would make any attempt at unity impossible. To this can be added the rationally possible diversity of means to the diversity of ends which we might rationally make use of. With but a few short, rational steps we see the multiplicity of variables already beginning to spin wildly out of control, a sort of whirling dervish of rationalism. ﻿﻿The true rationalist would counter that we are much mistaken if we believe there to be a multiplicity of ends. Reasons is one; to any given question, the same answer must apply, to everyone, at all times, at all places. That is the essence of rationalism. And it’s the very reason why apostles of rationalism ought never be allowed to have unfettered authority over our lives, for in its essential form, rationalism becomes authoritarianism, and it in no way eases the weight of the chains to know that they have been placed about us in a rational manner. So what does this leave us with? It leaves us with muddling along, getting by as best we can, choosing to care or not to care, as is our wont, making our way gamely through life’s trials until those trials are done. There are no grand plans, no masterful strokes by which all is made right. There is just the inordinately complex fact of billions of lives being pursued—vigorously, timidly, fretfully, ignorantly—and each one of those lives of necessity sure of its own infinitude because the mind cannot encompass something so vast as nothingness. It may not be a vision to inspire, but the universe remains obstinately indifferent to our desires, and the steamroller of reality will flatten us all, however much we might stand in its path, frantically waving our arms in our madness and delusion.